Free Printable Minecraft Word Search. Free Printable Minecraft Word Search activity of the famous sandbox video game. Have some fun searching for words related to Minecraft video game. You can share this activity with all your friends, students, parents, neighbor and co-worker. Great for your next Minecraft themed birthday party. Find words from Minecraft like Bedrock, Mobs, Minecon, Biomes, Adventure Map, Lapis Lazuli, Ore, The End, Ender Dragon, Block, Build, Zombie, Diamond. 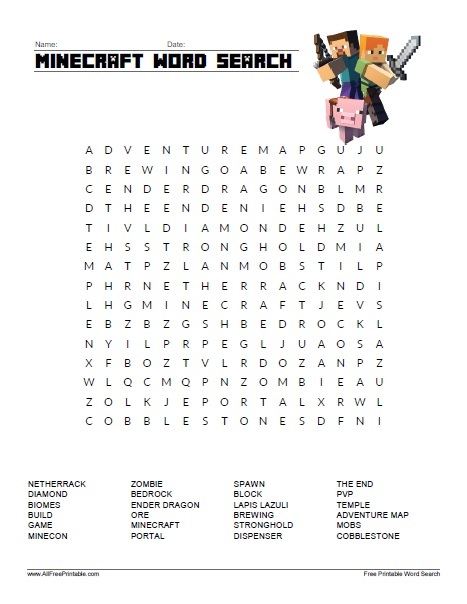 This word search includes 24 Minecraft words and the answers on page 2. The Minecraft Word Search Puzzle is ready to print in PDF format.